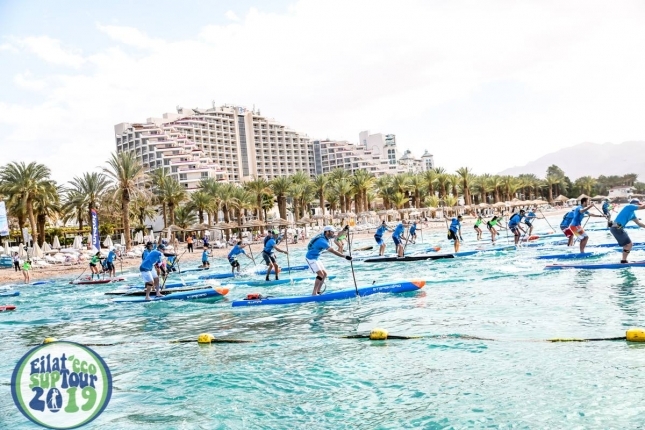 In brief: The 2019 EuroTour kicked off in Israel on the weekend, with Bruno Hasulyo and Amandine Chazot taking out the Eilat SUP Tour in the south of the country. Bruno’s win was his first outing since joining Team Lightboard (the new boards looking pretty solid). The Hungarian world-beater outlasted local dark horses Itzik Horesh and Liran Machlev. The uniquely-positioned race in Eilat saw competitors paddle through some pretty cool desert scenery within paddling distance of four different countreis: The borders of Israel, Egypt, Jordan and Saudi Arabia fall within a 15-mile radius around the resort town. More shots on the EuroTour Facebook.